Get Ready: Cooking for the clan this week? Watch out for fires! Cooking for the clan this week? Watch out for fires! Roasted turkey with cranberry sauce and stuffing on the side are many people’s Thanksgiving favorites, but it can be tricky getting all that food together safely. With all the hubbub, Thanksgiving sometimes brings an unwanted guest: fire. Thanksgiving is the leading day of the year for home cooking fires, followed by the day before Thanksgiving and Christmas Day. In 2015 alone, fire departments across the country recorded a total of about 1,760 home cooking fires on Thanksgiving Day. To keep your meal from going up in flames, brush up on these quick tips. Before you start cooking, take some time to test the batteries in your smoke detector. Check that your fire extinguisher hasn’t expired and is in an easy-to-reach location. Before using the stove, clean off residual grease and tuck in any loose clothing you’re wearing. Keep any kitchen items that can catch fire — like paper towels, plastic bags or cookbooks — away from the stove. Be sure to use a flame-resistant mitt when reaching to get the food you worked so hard to cook out of the oven. With all the commotion of guests arriving, it’s easy to get distracted, but you should never leave your stove unattended. Something could quickly spark while you are away. Keep an eye on the kiddos and tell them not to play near the stove. 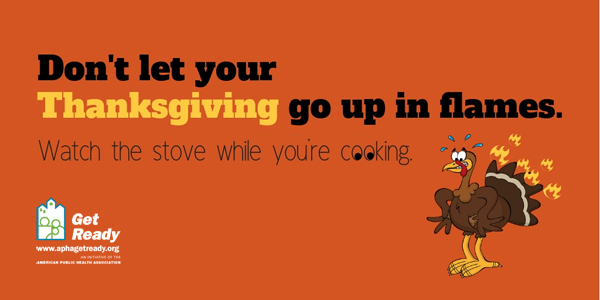 There’s an even higher risk for fire if you’re frying your turkey. If you choose this method, make sure your turkey is completely thawed ahead of time. Don’t overfill the fryer and never ever leave it unattended. If you see oil begin to smoke, turn off the gas supply immediately. Happy Thanksgiving and safe cooking!